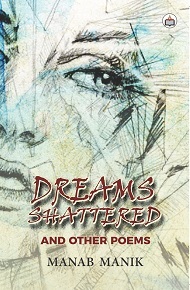 Mr. Manab Manik’s poetry collection book titled Dreams Shattered and Other Poems does touch upon all the conceivable themes related to day-to-day life unfolding in our society. One of the focal points innate in these poems is their conformity and consonance with naked realities of life fair and square. These poems also reflect holistic aspects of life with an attitude of simplicity and humbleness. The creativity shown in the delineation, the dexterity associated with the style displayed, the aesthetic appeal emerging out of these renditions and the unique co-relation in terms of ideas and concepts so explicated here do elevate this book into that domain of authenticity and speciality. The poet Mr. Manab Manik has come into a state of literary advancement through the publication of this poetic venture. My best wishes to him in his journey through the trajectory of imagination and literary flourishment. Manab is an explosively evocative poet with an insightful vision of us people as die-hard dreamers for a better world, be us farmers, vegetable sellers, rickshaw pullers on the crowded streets, or potters and masons. His heart palpitates in tsunami aches and pains to see these commoners’ dreams shattered in quest for daily bread and longing to rise above their poverty. These 65 poems will move you to deep understanding of a world we should not disregard. Born in 1984 and brought up in a poor middle class peasant family, Manab has felt hunger and poverty and seen dreams in the eyes of the members of his family. With dreamy eyes and financial difficulty he went to Jhakra High School, Midnapore College and Vidyasagar University, dreamy institutions not more than 70 miles away from Calcutta (now Kolkata) in the Eastern part of India. Since his class eleven he has been composing poems, inseparable companions and resting resorts of his life in many moods. In publishing poems he has remained like a lone hermit. In spite of having more than 200 poems after many years comes his debut volume.